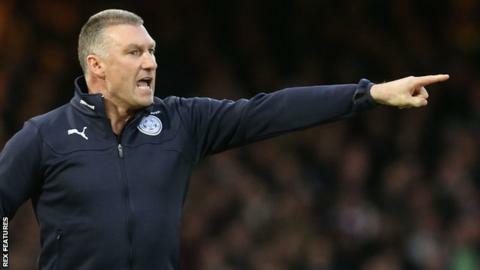 Derby County have appointed former Leicester City boss Nigel Pearson as their manager on a three-year contract. Pearson, 52, has been out of work since being sacked by Leicester City in June 2015, having taken the Foxes to Premier League safety. Darren Wassall, who guided the Rams to fifth in the Championship before their play-off semi-final loss to Hull, will return to his role as academy director. Former Derby left-back Chris Powell will join as Pearson's assistant. Ex-Carlisle and Southampton manager Pearson was first appointed by Leicester in 2008, and led the club to promotion from League One during his first season in charge. After losing to Cardiff in the Championship play-offs the following season, he left the Foxes to take over at Hull - only to return to Leicester again less than 18 months later. Pearson went on to lead them to the Premier League in 2014, but was sacked when relations between him and the club's board were "no longer viable". The Foxes won seven and drew one of their last 10 games under Pearson to retain their top-flight status, which they went on to top as champions this season. "Nigel is a proven winner, a highly experienced manager who has track record of success in the Championship," chairman Mel Morris told Derby's website. "We believe Nigel is the perfect appointment and will build on the solid progress we have made in recent seasons but more importantly, will enable us to achieve our long-term objective of Premier League football." Despite a spirited second-leg play-off performance against Hull, Derby failed to reach the final and will now spend a ninth consecutive season in the Championship. They sacked manager Paul Clement in February despite being just five points off top spot, with Wassall taking over until the end of the season. "Darren is a very talented man, who put his full energy and vigour into the task and we are delighted he will continue to play an important part in the club," added Derby president Sam Rush. "Nigel is a highly sought-after, talented, manager and I know he will give us absolutely everything to make this club successful. I am excited with what the future holds."